Urban Taggers. : io9: Nerf Zombie Strike full line up revealed for 2014. WOW. 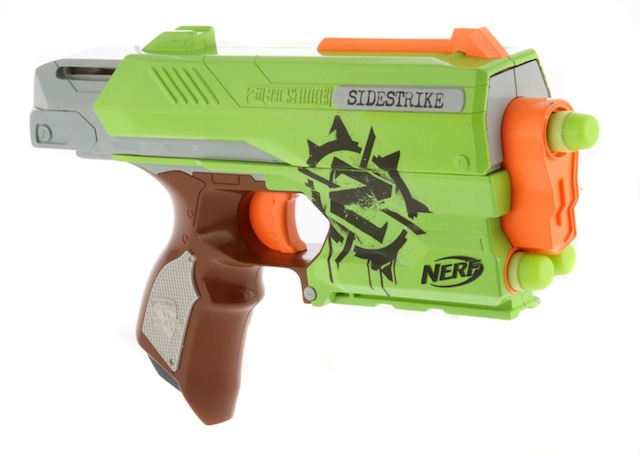 io9: Nerf Zombie Strike full line up revealed for 2014. WOW. 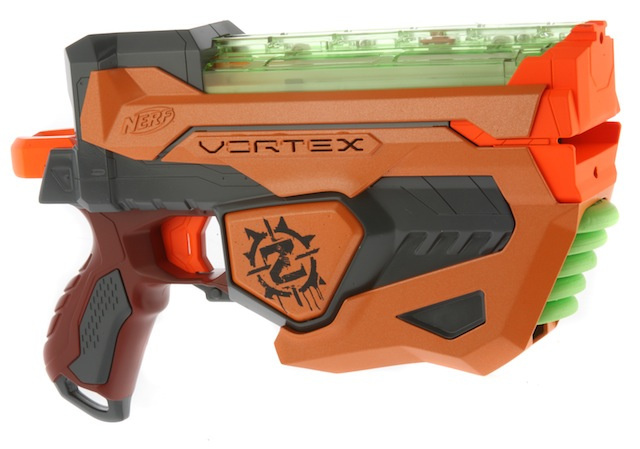 Up until this point, Nerf's upcoming Zombie Strike line has been a little left field, coming out of nowhere and with little intel on what it is and how it'll line up alongside other Nerf gear. 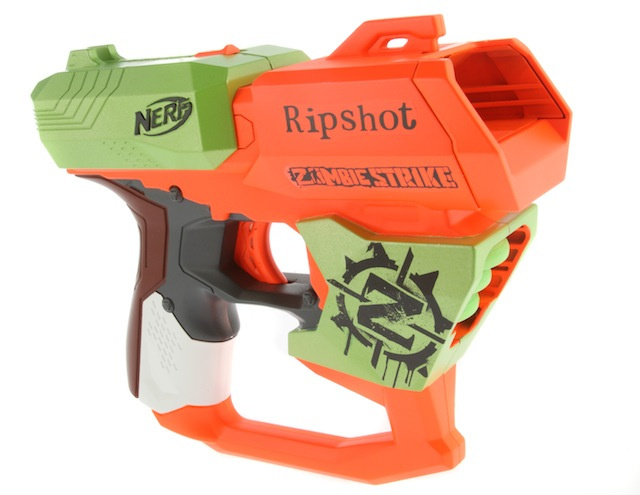 Out of the blue, pop culture and tech site io9 just got the mad exclusive to the official Zombie Strike press release, complete with what we love the most- details of NEW BLASTERS. There will also be a Nerf Zombie Strike Target Set ($9.99), featuring a small blaster, three darts and a Zombie Strike target. Awesome line, I love the new original designs and this is definitely a must have line for us here at UT, we are pretty excited! What about you, which ones stand out as the one(s) to get for you? Although I love that Nerf is coming out with a brand new line of guns for us to play with, I'm going to play devil's advocate for a second and say that a lot of these look like very uninspired recolors of already existing blasters. When I first saw the Sledgefire and the Hammershot I thought Nerf was going into some very risky but very amazing territory in regards to design. However, the Strike Blade and the Crossfire Bow (Daryl Dixon anyone?) look stunning. How they perform is a whole different story, though. OH MAN! I WANT THAT CROSSBOW!!! I might hold out for the ZS line instead of the rest, with the exception of the Rapidstrike. The Sledgfire and Hammershot are still gonna come out too right? Becasue those are the best, followed by the crossbow and the Sidestrike, IMO. not many tactical rails on these new blasters. Honestly, I'm feeling a bit disappointed. It seems that the Sledgefire (which looks awesome, by the way) is the only rifle type blaster in the series! I dunno, can you consider the Crossfire Bow a rifle? hmmph. In any case, I'm really looking forward to that Sledgefire. Is there an official release date? Thanks for the great update! id call it a rifle.......because of the stock attatchment. paint up a raider or switch shot stock and your good to go! I'm in heaven. So many pistols, so little money! I'm particularly interested in the Sidestrike- holster, you say? Also, it's been years since NERF has made a single-shot slide-action pistol. My only real qualm is the obscene number of Vortex blasters- a line I am not too fond of, as I am an accuracy freak. The Crossfire should replace ye olde Nite Finder as the most prevalent mod- put in some stronger string, maybe a new tension arm, and you've got a significant increase in distance. Or, just take off the tension arm entirely (if I think it works the way it does) and you've got Mr. Fredrickson's rifle-type blaster. Zombie-killing is all about style, and most of these blasters have that in spades. 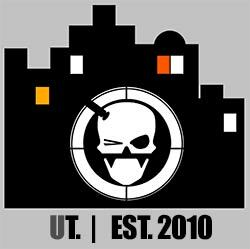 Zombie killing is all about efficiency, survival, resource management, tactical thinking without real planning and precision. Isn't this what comment moderation is for? [Alex] Wow, the Crossfire crossbow just made my day D: that thing looks boss and as an added bonus it can take a shoulder stock attachment... Switchshot supersoaker shoulder stock anyone? Im also very keen on the Sidestrike... I was just playing with the Scout blasters with my brother yesterday, and we dreamt about if they made an elite version that shot further: its just such a comfortable and compact blaster and the sliding priming bar action makes it feel awesome to use... And that's where this Sidestrike comes in :D I'm stoked! Lol Original? Anybody else realized that half of these blasters should be in the Vortex Line by itself. Yeah, but a majority of this lineup so far are blasters that shoot discs. I wonder what main series does that? The Hammershot brings innovation with a new cocking mechanism. Aesthetics aside, the blaster is interesting. The Sledgefire was a bit of a let down, but I will not judge until I get my hands on it. The rest of the "new" blasters don't seem to offer this innovation, and are easily surpassed by other blasters, both in aesthetics and functionality. Nobody will use a single shot or 3 disc blaster effectively. It's simply impossible, when you have a 40 disc drum mag available with a similar product. Also, the colour scheme makes the blasters look cheap. Remind me a bit of 1970s kitchen sets. Particularly the Ricochet and the Crossfire. Some might disagree, but this is just the way I see it. The other blasters actually have interesting designs, despite the ugly colours. Just wondering- what do you all think about the Sledgefire's firing/priming capabilities? Will it have a single shot function like the rough cut, or will it be limited to always shooting three darts at a time. On that note, the Sledgefire looks like a great candidate for some grenade launcher mods! Only time will tell, but it looks to me that with a wee bit of tinkering, the Crossfire could be equipped with the slide from, say, the Retaliator, or something. 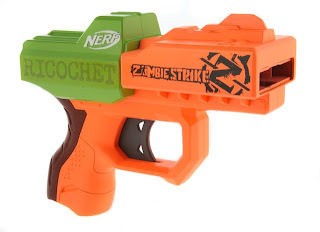 In any case, I'm pretty pumped for the Zombiestrike blasters to hit shelves! Cheers! Thematically these have a very 'tacked on' feel. The Crossfire and Sidestrike obviously would have been released in the Elite line, they even have the Elite logo molded on the grip. 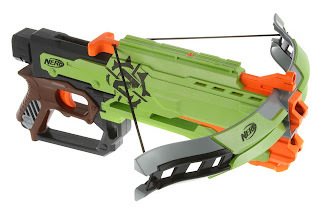 They're also basically new versions of the beloved Nerf Action Crossbow and the Unity System Scout. The Vortex blasters obviously are disc counterparts to already existing dart blasters which would have surely been released in its own main Vortex line. Fusefire is the customary dedicated glow blaster (lumitron is just a praxis after all), Ripshot seems like a Proton replacement for the Nitefinder spot seeing as it has the ubiquitous front ammo storage, and the Ricochet is the customary pocket blaster like your Jolt/Triad/Reflex. The only "true" Zombiestrike blasters are the first two reveals, Hammershot and Sledgefire which most likely is the case why they were the first to show up in the first place. Hasbro prolly just saw the popularity of HVZ and zombies in general so they threw in the others in the mix to achieve the illusion of line diversity. IMO I wouldve wanted the Crossbow and Sledgefire in Elite colors or at least the White color schemes we all love. Not a fan of Vortex green at all. Correction, Crossbow and Sidestrike in Elite colors, not Sledgefire. a collection without a shotgun? Can you really call that a proper zombie lineup? I totally love the crossbow, other than the "putrid green". Nothing a little paint won't fix. ^The Sledgefire is a shotgun. It has shells and shoots multiple darts. Hopefully the shelld will be avalible in refill packs and possibly have other blasters use them. Hmmm, the idea of Nerf shells seems very interesting. I'm wondering if the Vortex Ammo Belt Kit could be modified to hold extra shells. Just a thought. The crossbow is half of a Roughcut, look closely at the front! what? looks nothing like a roughcut. The crossbow has 4 circular holes in the front, in the same fashion as the roughcut has 2x4. I'm thinking it has the same internals as one side of a roughcut, and fires the same as well. I hope they do a longshot repaint and maybe a recon repaint as well. They've done like a MILLION Recon repaints! the crossbow looks so badass but a little overpriced hopefully it will be cheaper here in the uk????? The crossfire was the name of an old dart tag pistol, I think. The only ones i'm getting here are the crossfire, the hammershot, and the slegefire, because there originals, not just spun off a N-strike or Vortex gun.